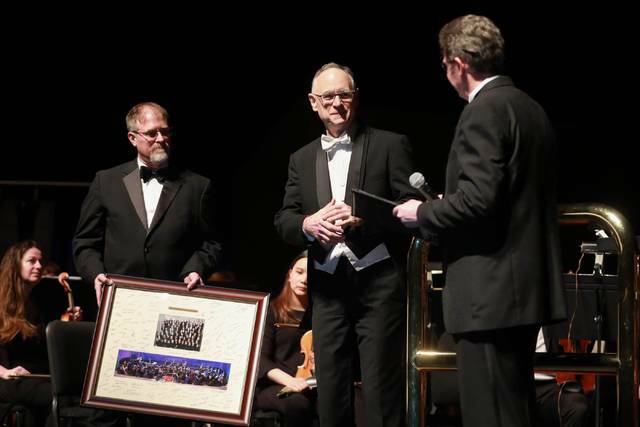 LIMA — The final curtain has come down on the Crafton Beck era with the Lima Symphony Orchestra. Saturday night was the farewell concert for Beck, who took over the baton from Joseph Firszt in July of 1997. His final concert featured Gustav Mahler’s Ressurection Symphony which featured the symphony and the Lima Symphony Chorus. “This whole week has been an overwhelming week. I knew that I could never anticipate what this week was going to be. I’ve never experienced anything like it and I’ve realized that I’ve never had, with my family or my parents or a mentor, watched them go through having a place they’ve touched a lot of people over 22 years and then tried to say goodbye. I’ve realized you just can’t. I did somehow know a year and a half ago when we chose this piece of music that we’re doing this evening that this would be the piece to express a goodbye or farewell and this is the circle of life. Things end so new things can start again and that’s what this piece is about,” said Beck, just prior to the concert. Paul Hoverman has been a trumpet player with the Lima Symphony since 1987 and has worked with both Firszt and Beck. “Over 22 years he’s taken it (the symphony) to much greater heights than what we were when we started. He’s brought in people from just all over the region that play in the symphony now so the quality of the players has really improved a lot, and because of that, the orchestra has improved a great deal in quality,” said Hoverman. Alan Mikesell is a former Lima Symphony board member. “I remember the day he came and never thought he would be here for 22 years and so I’ve been very happy, but it’s hard to replace a director that’s been here so long,” said Mikesell. Elizabeth Brown-Ellis, executive director of the symphony called the evening “bittersweet”. “We are celebrating tonight. We are taking a moment to really just be in this moment and enjoy everything that Crafton has built in this orchestra and celebrate his legacy of 22 years,” said Brown. The search for a replacement for Beck will shift into high gear in the coming months. “We have eight finalists. We’ve been working on this actually for about a year and a half. They will all come into the community. They’ll spend a week with us. They’ll conduct a concert, get to know all of the important players, the chorus, the orchestra members, board members all of the community members and then we’ll have a popular vote and see who wins,” said Brown. It was announced during the concert details of the Crafton Beck Endowment Fund. “The board created a matching gift of $7,000 that will benefit our endowment and help us remember Crafton and carry his legacy into the future,” added Brown. Beck isn’t through with conducting, as he will continue to work with the Mississippi Symphony Orchestra in Jackson Mississippi.